Provide comfort for the family of Jimmie Crosgrove with a meaningful gesture of sympathy. 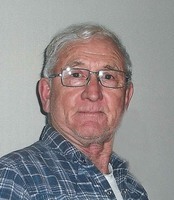 Jimmie Wayne Crosgrove, 79, of Merrill, Iowa passed away on Thursday, February 7, 2019 at Brentwood Good Samaritan Village in Le Mars, Iowa. A time of visitation and sharing will begin at 2:00 p.m. on Wednesday, February 13, 2019 at the Mauer – Johnson Funeral Home in Le Mars. The family will be present from 5-7 p.m. with a Celebration of Life Service at 7:00 p.m.
Jimmie Wayne Crosgrove was born on August 6, 1939 in Woodbine, Iowa, the son of Ralph and Darlene (Barsby) Crosgrove. He began his education in Woodbine and later attended high school in Castana, Iowa. On May 12, 1962, Jimmie and Barbara Ruedy were united in marriage at Elk Point, South Dakota. He held various jobs prior to entering the United States Army on November 24, 1962. Jimmie served overseas in France until earning an honorable discharge on November 2, 1964. He returned to the states and began a longtime career in trucking. Jimmie drove for Cargill, OFC and Bartol logging over 3 million miles. Most recently, he was driving part-time for Rich Vander Kooi. Jimmie was a 50 year member of the American Legion. Grateful to have shared his life is his wife, Barb of Merrill, IA; two sons and their wives, Brian and Christine Crosgrove of Minneapolis, MN and Michael and Khay Crosgrove of Vientiane, Laos; 6 granddaughters, Abby, Shannon, Isabel, Aislinn, Andrea and Nicole; 2 great-granddaughters, Evangeline and Gwendolyn; brothers and sisters and their spouses, Gary and Elsie Crosgrove of Sioux City, IA, Marline and Tom Heuretz of Le Mars, IA, Mervin and Lila Crosgrove of Merrill, Iowa, Debra and Mike Burke of Waterloo, IA and Denise and Harvey Hansen of Sioux City, IA; sisters-in-law, Nancy Riley of Sioux City, IA and Janice Bolte of Merrill, IA; and several nieces and nephews. To send flowers in memory of Jimmie Wayne Crosgrove, please visit our Heartfelt Sympathies Store. The family will be present from 5-7 p.m. with a Celebration of Life Service at 7:00 p.m.
Tony, Pam and family sent flowers to the family of Jimmie Wayne Crosgrove. Dear Barb, Deepest sympathies to you and your family.May God's comfort and peace be with you. With Christian sympathy, Dennis and Lois Kinney. Fond memories from when the Crosgroves lived down on Douglas Street in Merrill. Hung out with Brian andMike when we were all much younger, back in the 70s. Thoughts, sympathies and prayers are with Barb and all of the Crosgrove family. May Jim’s spirit shine for all eternity. Take care! Love to all! God Bless! My sympathy, Barb, for the loss of your husband. Hang onto all your special memories. Tony, Pam and family purchased flowers for the family of Jimmie Crosgrove.